When you want to wear men's linen outfits that set you apart from rest, Prestige is the brand for you. That is because Prestige makes men's linen outfits out of only the very finest Irish linen fabric and designs them into casual style outfits that are intent on eye appeal. 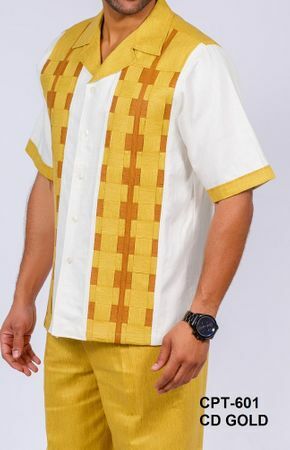 This rich looking gold with ivory color Irish linen mens outfit features a large cube pattern designed shirt that has the contrasting colors woven creating a unique look that is sure to look great on you. The pants are single pleat and baggy fit and are all made of Irish Linen.